Chhatarpur is one of the few places around Bhopal in Madhya Pradesh which make for a perfect weekend getaway. How about exploring the rich history and culture of Madhya Pradesh this weekend? If you are a history lover and love exploring the hidden corners, then a trip from Bhopal to Chhatarpur is your calling. Chhatarpur is famous amongst tourists for the Khajuraho Group of Monuments and a few beautiful waterfalls and religious sites. Hence, it has become a popular weekend destination for the locals and offbeat travellers. It is also a preferable picnic spot due to the presence of so many mesmerising spots. How about embarking on a journey from Bhopal to Chhatarpur now? Read on to know more about this wonderful and exciting journey. Lying in the central region of India, Chhatarpur experiences an extreme type of climate and hence, summers are hot here. However, due to the presence of several historical monuments, it remains a year-round destination for history lovers. It also attracts several photographers and picnic goers on account of its photogenic and peaceful surroundings. If you do not wish to explore Chhatarpur during the summer season, then the best time to visit is from October until the end of March. By Air: The nearest airport is located at Khajuraho at a distance of about 40 km from Chhatarpur. From the Khajuraho airport, you can take a cab to reach Chhatarpur. By Rail: There is a direct train available from Bhopal to Chhatarpur. You can catch Mahamana Express from Bhopal. By Road: Chhatarpur is situated at about 330 km from Bhopal and has a good network of roads. Hence, it is easily accessible by road. Route 1 is the fastest and hence, it is advisable to take route 1 as it will take an approximate time of 7 h to reach your destination, i.e., 1 h lesser in comparison to the other route. While on your way, you can also visit Sanchi and Sagar. Sanchi is one of the most popular places in Madhya Pradesh and is famous for its Great Stupa, which is believed to be one of the oldest stone structures in the world. As per records, Sanchi was once inhabited by Buddhist monks and dates back to the era of the Mauryan Empire. You must catch a glimpse of the Buddhist Complex at Sanchi if you are looking at learning about the history of India. Sanchi is located at a distance of about 280 km from Chhatarpur and 50 km from Bhopal. Sagar is one of the major cities of Madhya Pradesh and is popular amongst tourists for its beautiful lakes and ancient temples. It is located at a distance of about 170 km from Bhopal and 160 km from Chhatarpur. The major places to visit here include Lakha Banjara Lake, Neminagar Jain Tirth and Pateriaji. How about getting yourself relaxed in the spiritual environment of its temples? Chhatarpur is an ancient settlement and is believed to have been founded during the 18th century by the Rajput King Chhatrasal, after whom the town is named. However, later on, the town was conquered by the British army. Today, Chhatarpur is famous for its tourist spots, which include waterfalls, temples, caves and other monuments. Once you are within the boundaries of Chhatarpur, the following are the places which you must visit here to understand its beauty. Khajuraho, a small hamlet, has become a common name over a period of time on account of the presence of the world-famous Khajuraho Group of Monuments, which is a group of several Hindu, Jain and Buddhist temples with some of them portraying eroticism. These temples are said to have been constructed during the 10th century by the Chandela dynasty. 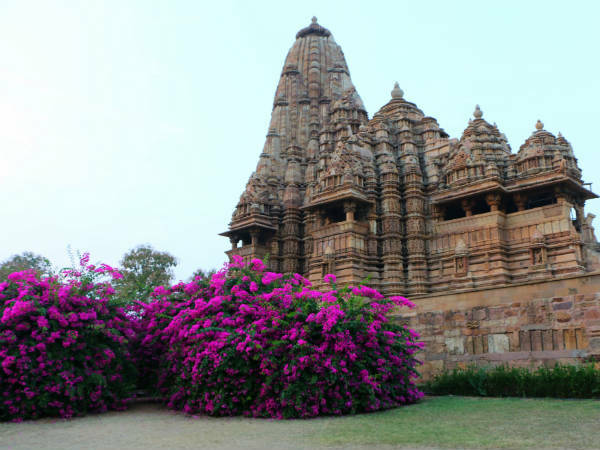 You must visit Khajuraho while in and around Chhatarpur in order to learn in detail about the architectural beauty of the temples and the rich history of the region during Medieval India. One cannot simply forget to visit this wondrous beauty which is famous for its peaceful surroundings and relaxing waters. You must take a break at Pandav Falls if you are looking at soothing your mind, body and soul in an unpolluted atmosphere. It is located at a distance of about 60 km from Chhatarpur city and is also said to be the site where the Pandavas from the epic Mahabharata stayed during their exile. Jatashankar and Bhimkund are two most visited sites of religious significance in the region of Chhatarpur. Jatashankar is an ancient cave temple dedicated to Lord Shiva and is located at a distance of about 50 km from Chhatarpur, while Bhimkund is a water tank which is believed to have been formed by Bhim, one of the Pandavas, in order to quench the thirst of his consort, Draupadi. Hence, it is considered as one of the holiest places in the region. Apart from above-given places, there are several other places of interest which can certainly surprise you with their natural beauty and historical significance. These places include Kalinjar Fort, Raneh Falls, Bambar Baini, Hanuman Tauria, Maharaja Chhatrasal Museum, Gangau Dam and Panna National Park.